US Lighter Than Air Corp. (US-LTA) is the manufacturer of the 138S blimp, one of the very few blimps operating with a single engine and inverted-Y tail surfaces. The 138S is type certified and can thus carry out commercial operations. 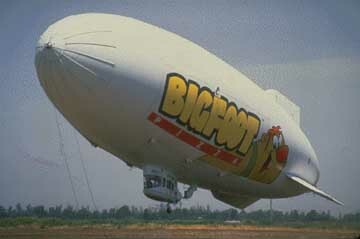 While airship #002 was lost in an accident, the prototype #001 was deflated in 1997 after standing idle for several months. US-LTA has performed operations as recently as Fall 1995 for the Applied Physics Laboratory at the University of Washington, the U.K. Ministry of Defence, the National Oceanic and Atmospheric Agency (NOAA) and a host of others. US-LTA have logged over 2000 hours in this field under a broad range of circumstances and payloads up to 3200 lbs. US-LTA 138S #002 promoting Pizza Hut. For more information please visit the US-LTA Web Site or contact US-LTA directly.